“Amazing” Elma Grace Rediske was born September 5, 1920 in Chewelah, Washington. She is the third child of Emily and Nelson (Ned) Betty, four sisters Beatrice, Lorraine, Nedra, Kay and one younger brother, Howard. For a short term, her family lived in Centralia, Washington before moving to Okanogan. It was there her father got a job working for the forest service which resulted in the construction of the family cabin in Conconully. Her love for books and reading paid off when she was awarded a scholarship to Eastern Washington College. After earning her teaching degree she taught second grade for one year. Forty students and a $1500.00 yearly paycheck sent her packing. She ended up at Fort Lewis where she met August F. Rediske, the love of her life. Many car rides to work and a first date to the Ice Capades led to their marriage on July 3, 1953. A devoted and loving mother to Brian and Beth she played a very important role in their lives. For Brian she was the Den Mother of his Cub Scouts and Beth the Bluebird Leader of her Camp Fire Girls. Aside from this she was very active in their school’s PTA receiving the Golden Acorn Award for all her work. In her spare time she attended Beth’s swim meets and Brian’s sports games. Loving sports all of her life she followed the Seattle Super Sonics, Seahawks and Mariners almost as religiously as church. If there was a game on, you knew she was watching. If you weren’t, she surely told you about it. At Trinity Lutheran, she was a member of TLCW, Ladies Circle and a long time quilter. Quilting up until the ripe age of 97, we have figured her to have sewn about 9,600 quilts. These quilts have been shipped all around the world to families in need. In addition to this she knitted and knitted hats, scarves, sweaters and blankets galore. These too have been gifted or mailed out to people. Her love has been spread worldwide through her charitable works. She also enjoyed bowling in league and traveling with her husband Gus. They cruised on ships with her sisters, took rode trips to the cabin in Conconully, flew on planes to visit family and grew a large garden which they shared with family and friends. Her life changed unexpectedly when her husband was in a tragic accident. She became a caregiver once again. First was for her Father in law, then Mother and now Husband. Always devoted and never complaining, she rolled with it embracing life with every challenge it threw in her way. Elma stayed calm and carried on. Her Grandchildren, Amanda, Zack and Jack kept her busy along the way. When Amanda came to sleep over it usually meant neighbor Katey came to visit too. Together they were able to build forts, set up farm stands selling produce from the garden and learning a lot from Grandma. After her husband Gus passed in 2003 she adopted a Pembroke Welsh Corgi named Cooper. She always loved animals. Cooper, or her “Coopie” was spoiled and together they were a good match. He was what she needed at that time and he kept her company. Her busy social schedule included daily lunches at church, playing cards with multiple groups and attending special occasions with family and friends. Elma was an avid reader, letter writer and card sender remembering many. Living at home for 98 years was possible with the support of her family, niece Janette, Janice, Jean and Warren, their family’s and other care givers who came calling. The family wishes to thank the caring nursing staff at Tacoma General Hospital for their loving care and support. Elma is survived by: Son Brian (Roberta) Rediske, Daughter Beth (John) Ogburn; Grandchildren: Amanda Rediske, Zack (Crystal) Rediske and Jack Ogburn; Great Grandsons: Henry and Wesley Rediske; Sister in Law: Mrs. Howard Betty and numerous loving nieces and nephews. May Elma’s memory be eternal. 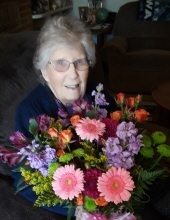 To send flowers or a remembrance gift to the family of Elma G. Rediske, please visit our Tribute Store. "Email Address" would like to share the life celebration of Elma G. Rediske. Click on the "link" to go to share a favorite memory or leave a condolence message for the family.